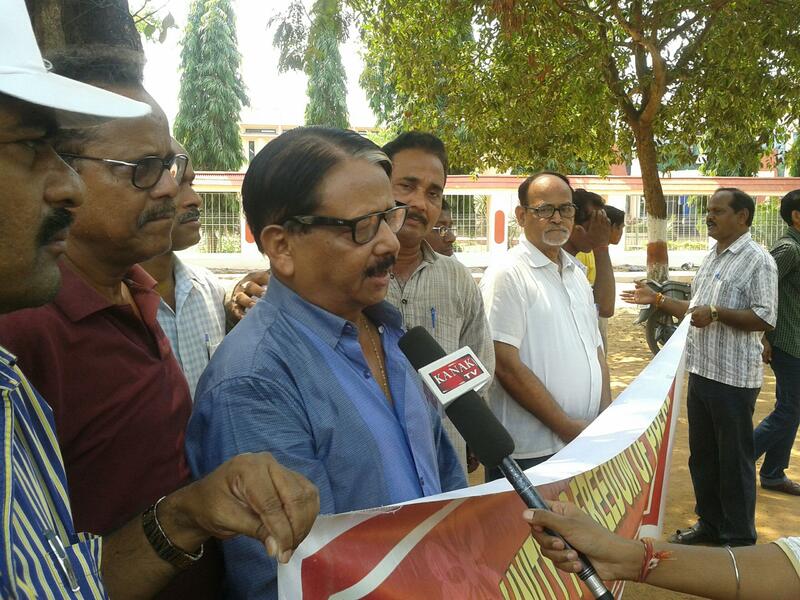 The Media Unity for Freedom of Press ( MUFP) today staged a protest demonstration under the Freedom Tree near Jaidev Bhawan against the brutal police attack on a television journalist Amitabh Patra while he was covering the local agitation at Dunguripali in Lower Suktel project area in Bolangir on the 29th of May. Sri Patra who is now receiving treatment at the Burla medical college hospital is still in police custody because he has been arrested on false charges that he was inciting the protesters ! The visuals captured by local media persons shows clearly how he was targeted by a group of policemen who beat him black and blue with lathis and kept kicking him even when he had fallen on the ground. The MUFP has demanded immediate and unconditional release of Amitabh Patra as well as the identification and arrest of the police officials who were involved in the attack that left him with serious head injury. The media body has also demanded payment of compensation for or replacement of Sri Patra’s damaged video camera. MUFP has strong reasons to believe that Sri Patra was targeted because he was recording the barbaric manner in which the police were beating up the peaceful protesters including young women with his camera. His camera was smashed before he was roughed up by a group of men in khaki who were reportedly drunk. MUFP has threatened to resort to state-wide agitation if Amitabh Patra is not released unconditionally and no action taken against the policemen responsible for the brutal attack on him. Over 30 scribes and photographers led by senior journalists Prasanta Patnaik and Rabi Das participated in today’s protest.